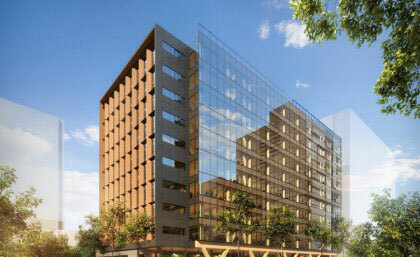 Brisbane, Australia — Australia will soon hold the record for the world’s tallest timber office building at 5 King St Brisbane, and with the help of The University of Queensland’s new research hub, wooden skyscrapers could become the norm. ARC Future Timber Hub (Australian Research Council) will be Australia’s leading timber research collaboration, bringing together experts from industry, government and academia. “This Hub represents an opportunity to transform not just our ability to design and construct healthy, resilient, sustainable tall timber buildings; but to engage and transform the entire industry — from the sustainable forests that provide the raw timber, right through to assembling the building safely on site,” he said. The Forte building in Melbourne was the world’s tallest timber building at 32 meters in 2010. They aim to develop new wood products that are custom-designed for the Australian context, hybrid (e.g., concrete-timber) construction systems and to address fire safety considerations in timber construction.